When I added my Swirling Gauntlets project onto my YOP list, I didn't think I'd ever get round (also translated: "be bothered") to finish them. Amazingly, though, I did finish them!! Swirling Gauntlets is a cabled fingerless gloves pattern by Susanna IC (zuzusus on Ravelry). Rizzle asked for a pair in Dark Blue, so I chose to knit them with James C. Brett Top Value DK in Royal Blue. I knitted the left gauntlet up very quickly, but things started to go badly wrong on the cable section of the right gauntlet, and that is how they came to be a hidden WIP. Fast forward 9 months and here we are. A couple of days ago, when I had nothing to knit, I decided it was time to stop procrastinating and just get them finished! I had to completely frog the right gauntlet as there was no way I could work out where I had started to go wrong. After a lot of squash, wine gums and a few episodes of Larkrise to Candleford (I'm slowly working my way through the series, onto series 4 now!) the right gauntlet was finished. 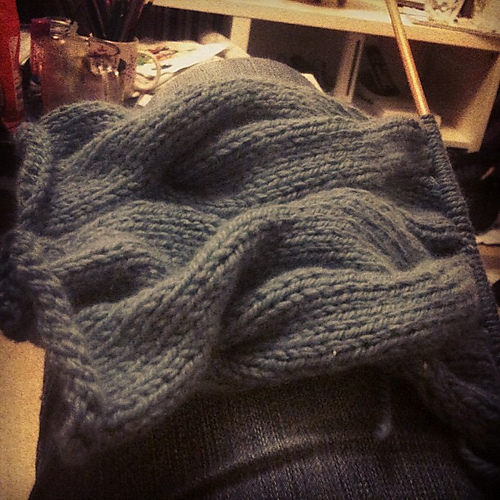 Now, onto the best knit, A Very Braidy Cowl by Maryse Roudier. I fell in love with this cowl at the first glance. What was even better was that I had the perfect yarn for it - Lion Cashmere Blend by Lion Brand in Dusty Blue. Michelle was having a stash clearout (cannot understand how people do that!) and very kindly gave me four skeins of this delicious yarn. I used one skein for Mother's Irish Hiking Armwarmers, so that left me with three squishy skeins. I knitted this squishy cowl over the course of a day, and I can tell you it was such a fun knit. I decided not to do the provisional cast on, and then graft the two ends. Instead I decided to seam it, next time though I will give the grafting a try. All I can say is that this my favourite ever knit. Yes, I was proud of my first pair of socks, and I'm rather jealous of Abby's Blanket, but this Braidy Cowl beats them all. The cashmere makes it incredibly soft,and the merino makes it lovely and work, basically it's the perfect neck cuddler (cowl). And for a change, here I am modeling my knits rather than Rizzle! For more Year of Projects posts, either head on over to the Come Blog-a-Long group on Ravelry, or search 'YOP1213' on Google. I am a new convert to provisional cast on and grafting ends together. It's brilliant! You should give it a go. Fantastic finishes - love both these projects. It must be a relief to have finished the gauntlets, and they turned out so well! Ohh...what a soft looking cowl-I can just imagine how cozy it is. Well done on finishing the mitts-I am sure it was a trial but what a sense of accomplishment you must be feeling! Your gauntlets are stunners! Very nice! And the cowl looks really comfy and warm. Well done! I want to make the fingerless mitts. They look great. Well done on the finish, it's always nice to finally finish something that has been in hibernation for ages! And I love the cowl, looks really soft!